With so many triple-A games arriving towards the end of the year, it comes as no surprise that Warner is not leaving anything to chance with the third in Rocksteady's Batman: Arkham trilogy. It has cunningly released Arkham: Knight, the first to hit the new-gen consoles, at a time when there are few rivals in shops. However, it needn't have worried as Arkham: Knight would have happily stood out even if having to share the limelight with others. It's an excellent addition to the franchise and an ideal response to the comparatively lacklustre Arkham Origins effort delivered by Warner's in-house development team last time out. Why? Well you'll just have to keep reading to find out why Arkham Knight is the killer title in the Batman series so far. When previewed and spoken about previously, much has been made of the inclusion of the Batmobile in this chapter and, yes, it is one of the major new elements of the game. But it is not the only innovation Arkham Knight adopts, nor is it the best. It is a headline feature though and is therefore worth discussing first. The Batmobile is, in effect, an extra gadget in Batman's ever expanding arsenal which adds a new way to travel Gotham alongside swooping and rappelling across the skies. It also allows the game designers to create all-new puzzles, racing objectives (albeit with a twisted difference) and Battlezone-style tank battles as it can double as a vehicle of mass destruction. Gotham this time around – or Arkham City, if you prefer – is vast and the Batmobile zips around the streets capably. But this is no superhero-daubed Grand Theft Auto clone and, if anything, the vehicle feels a little light on its wheels. Like us, you'll probably revert to swinging and gliding around the city as before unless otherwise prompted. Where the Batmobile comes into its own is as an external, remote-controlled tool to complete larger scale problems. Need a wall destroyed to escape a factory? Sorted. Need a couple of sentry robots destroyed before they blast your cowled face off? No problem. One side mission strand featuring the always welcome Riddler even opens up race tracks and platform puzzle zones under the city for you to find new uses for the Batmobile. And while they aren't particularly tough per se, they add variety to a game series that has previously been accused of rinsing and repeating. Beyond the Batmobile there's dual play combat, another new feature that is a product of Rocksteady having more processing and graphical power at its disposal this time around. Combat feels very similar to what we are already used to – after all, if it ain't broke don't fix it – but with the added bonus of a much greater quantity of grunts on screen at once. They can overwhelm when taken on solo and that's where dual play comes in. Dual play missions add additional Batman characters to the mix – including Robin, Catwoman and Nightwing – and they help you battle hordes of bad guys (who do always seem to be guys, it must be said), but with you still in control. During a fight you can switch between characters in a similar way to just about every Lego game out there (which might sound like an odd comparison, but that's also a Warner-published franchise). And if the two characters are close by you can pull off some awesome combo moves and dual takedowns. There are also environmental takedowns this time too, giving the option to crash down a ceiling light onto a foe's noggin. Or smacking one around the mug with a fire extinguisher. Combat has always been one of the Arkham franchise's biggest draws and with these new inclusions, it feels more fluent and fun than ever. For us, dual play combat is the headline feature we've been wanting for some time – to fight alongside the rest of the Bat family – and the Batmobile is a nice bonus. In all other terms, Batman: Arkham Knight delivers everything fans of the series would hope for, just on a far bigger scale. It is gorgeous looking, with almost persistent rain effects throughout the campaign making what could otherwise be a dark, uninspiring city a glistening, neon, if not deadly playing field. Think Manchester on a Friday night. The campaign has been given a shot in the arm too, although still follows similar tropes to previous games. The Joker has been replaced by Scarecrow as the main villain – at least initially – thanks to the events that occurred in Batman: Arkham City, but even then you soon find out that you are far from rid of the purple-cladded master of mischief. And a new, powerful fiend in the shape of the Arkham Knight soon reveals himself to be one of Batman's greatest challenges yet. We'll leave it for you to find out who that is. In short, if you love Batman or any of the previous Arkham titles, you are sure to love the storyline here. It is compelling enough to ensure you'll want to invest the 12 hours or so to complete the game. And once you do, there are a stack of extra missions, including virtual trials, that must be completed within certain parameters, available from the menu screen. For the PlayStation 4 version, as reviewed here, there's an exclusive Scarecrow DLC too. It is a weighty package that will delight fans. 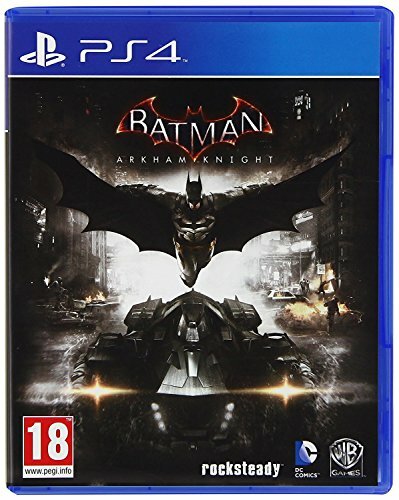 Batman: Arkham Knight provides enough action and adventure to keep fans very happy for the entirety of the campaign and has several other modes to try out along the way. However, as the first Arkham game on new-gen consoles it relies heavily on an understanding and affinity with the previous games in the franchise. While you will find plenty to like as a newcomer, some of it might not make sense in story terms and flashbacks are few and far between. Then there's the Batmobile, which is perhaps given a little too much billing for the amount that it really adds. For our money there are enough additional tweaks that amount to even more worthy reasons to purchase the game. We've enjoyed revisiting the dark world of Gotham, now in its biggest, boldest and best-looking form to date. Batman: Arkham Knight is everything we would have hoped for in a prospective conclusion to Rocksteady's trilogy.